Seniors Tryston Davis (left) and Wilson Caballero (right) cheer on McCallum Choir alumni as they join the current choir onstage. At the end of the last concert, former Mac choir members are invited to sing "The Lord Bless You and Keep You" by Lutkin. It is sung at the end of each choir concert to say goodbye to the audience. "I love it when the alumni come up and sing with us," Davis said. "It's so fun to see everyone again and get them back onstage." Photo by Jazzabelle Davishines. 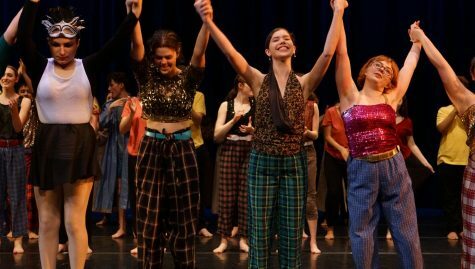 Finals may have taken over in late May, but that didn’t stop the fine arts programs from performing this month. 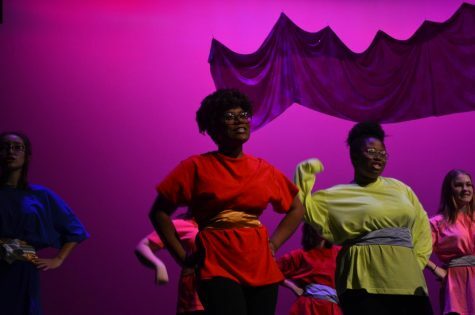 On Monday May 14, the Knights of Steel performed their last show of the school year, followed by the piano program’s Ensemble Piano Recital on May 17. On Tuesday, May 22 and Wednesday, May 23, respectively, the choir and orchestra performed their finale shows. 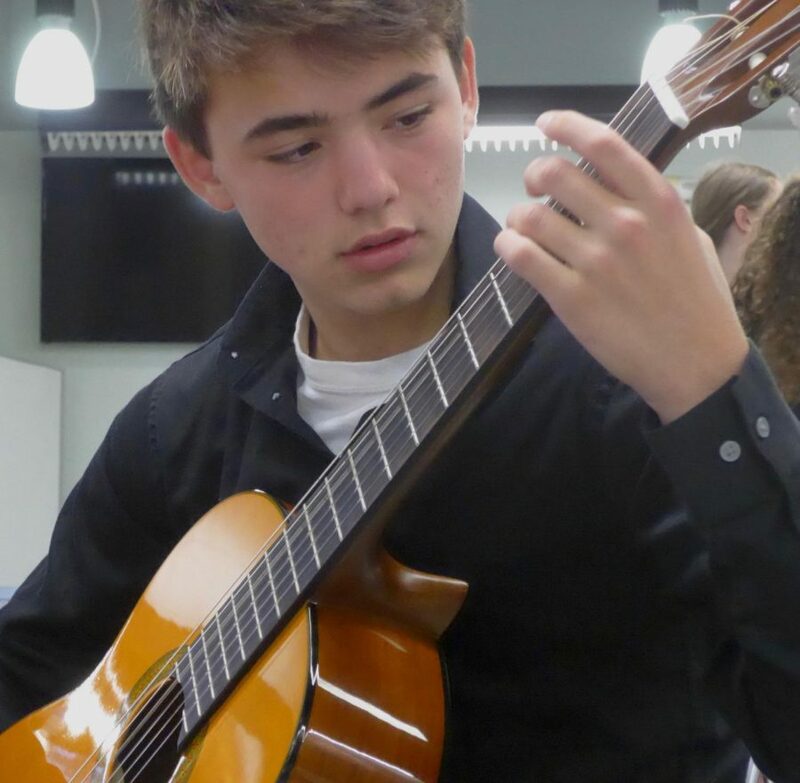 And despite the Memorial Day holiday on Monday of this week, the guitar program competed at the Texas State Solo Ensemble Competition at UT. In this week’s #TuesdayTop10, we recap all of these finale performances. 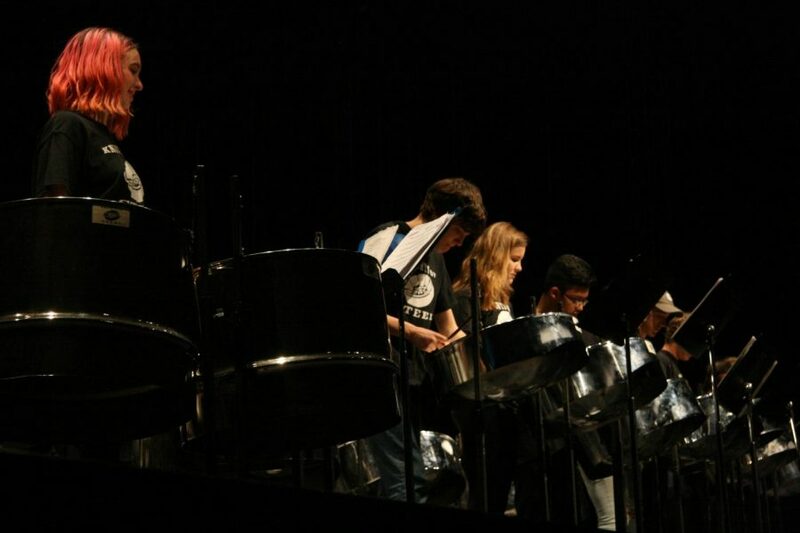 The Knights of Steel played their last concert of the year in the MAC on Monday, May 14. The steel drums program is pretty small but that means bigger opportunities to make good friends. There are only two classes to be in: beginner or advance. Even then, there are still only about 40 players all together. “I like being in steel drums because it brings me closer to the friends I already have and it found me some new friends." sophomore Sam Sherrill said. "It’s a close community and very drama free; we are all playing in peace.” Photo by Liana Smoot. 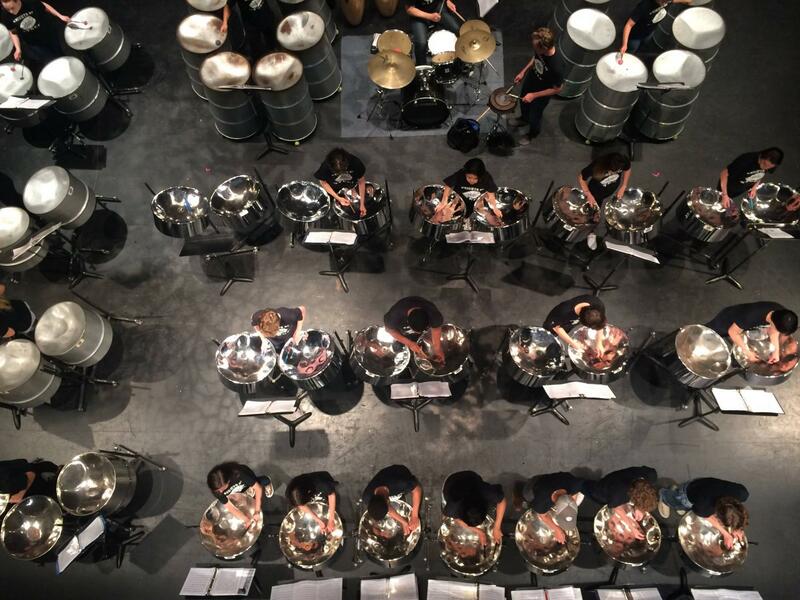 The Knights of Steel played their last concert of the year in the Mac on Monday night. Playing the bass drum, Sophomore Mira Maclaurin, looks onto her music as the chorus is being played to her side in the song "Hey Jude". "The crowd always loves ["Hey Jude], and it reminds me of the beginning school year." Maclaurin said. Photo by Aidan Golliher. 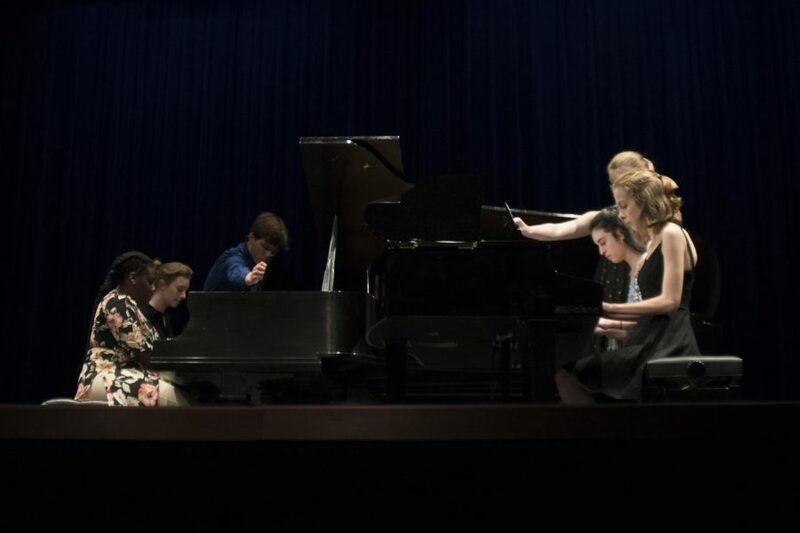 The piano program held the Ensemble Piano Recital in the MAC on Wednesday May 17, a night which featured performances from all MAC piano students. Photo by Joseph Cardenas. Freshman Marlee Foster performs a solo during the concert choir's rendition of "Keep Holding On" by Avril Lavigne. Many choir students had their chance to shine during the 2018 Spring Concert on Tuesday May 22, since several performances featured multiple soloists. 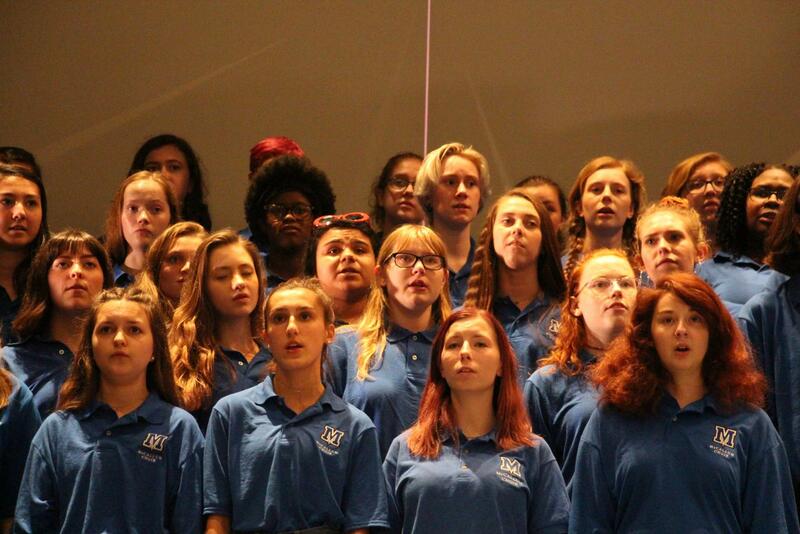 "A lot of people got to have a solo that hadn't had many in the past," freshman choir member Emma Wallace said. "It was really nice to hear them brought out at this concert." Photo by Jazzabelle Davishines. 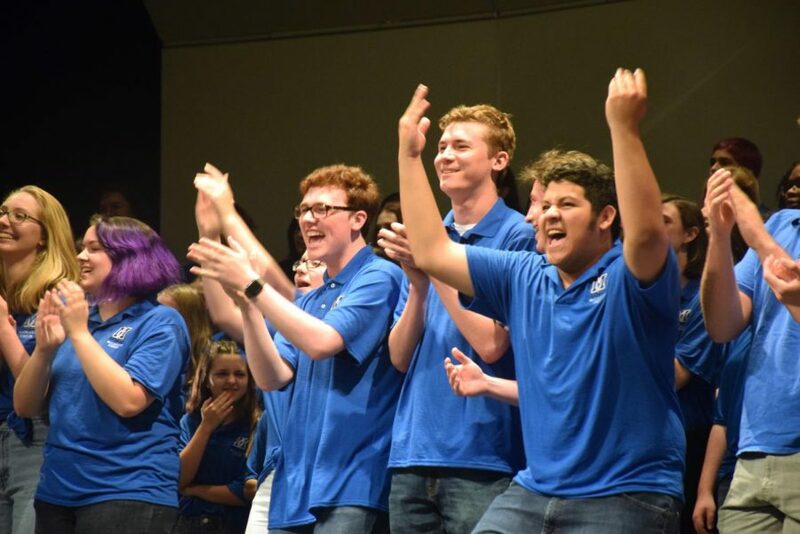 Seniors Tryston Davis (left) and Wilson Caballero (right) cheer on McCallum Choir alumni as they join the current choir onstage during the 2018 Spring Concert on May 22. At the end of the last concert, former Mac choir members are invited to sing "The Lord Bless You and Keep You" by Lutkin. It is sung at the end of each choir concert to say goodbye to the audience. 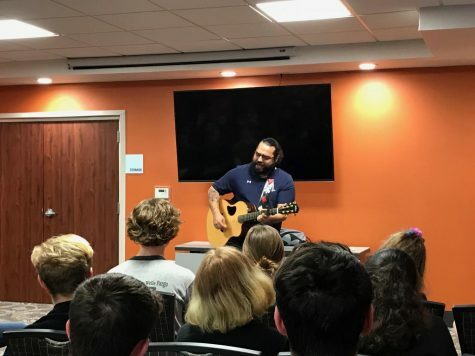 "I love it when the alumni come up and sing with us," Davis said. "It's so fun to see everyone again and get them back onstage." Photo by Jazzabelle Davishines. 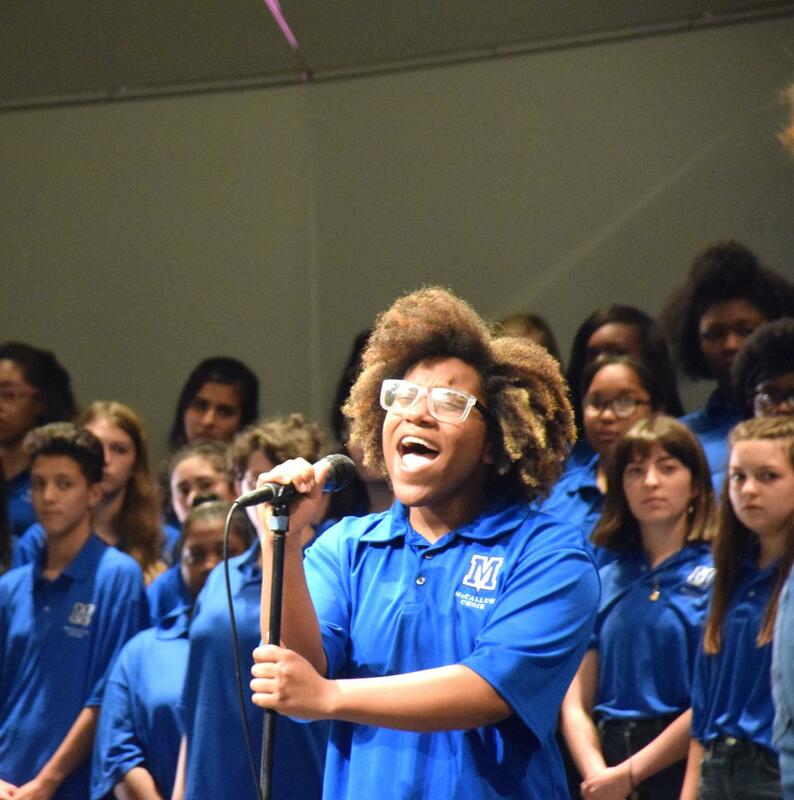 The choir closed up its final performance of the year on May 22 in the MAC with a warm and well-known piece, “Ain’t no Mountain High Enough.” This particular included many joyful,hopeful, and uplifting pieces signifying the fast approach of Summer. 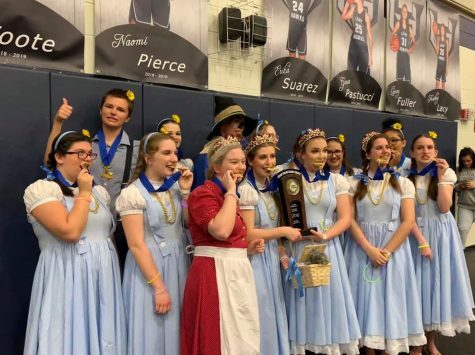 Sophomore choir major Jordan Erica said, “Our concert included a ton of spirited and joyful music since we weresaying goodbye to Mrs. Mainwaring. 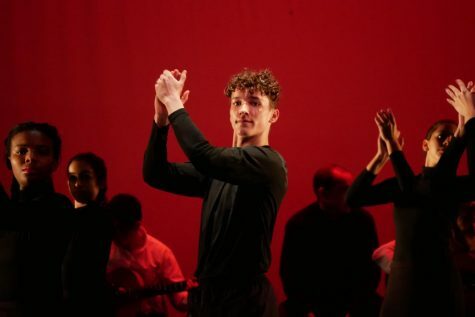 Photo by Finn Shehan. 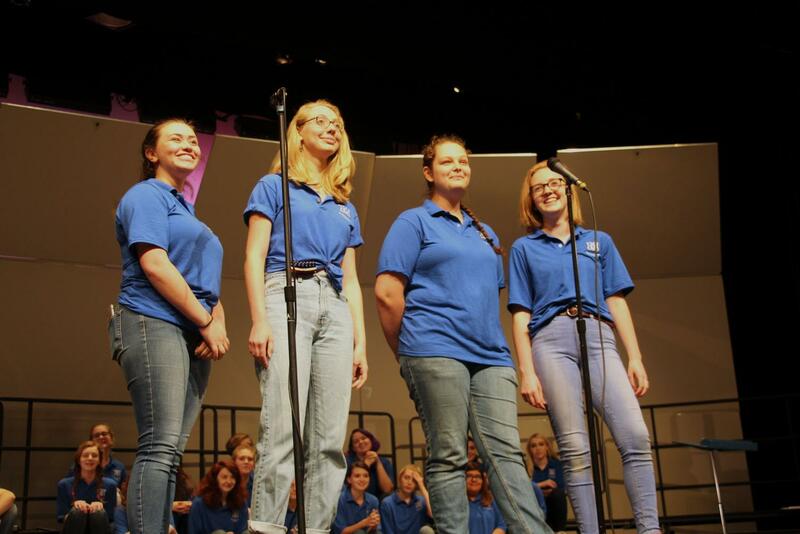 Seniors Hannah Young, Grace George, Vivien Blumofe and Molly Leach perform a quartet at the Choir Spring Concert on Tuesday night in the MAC. 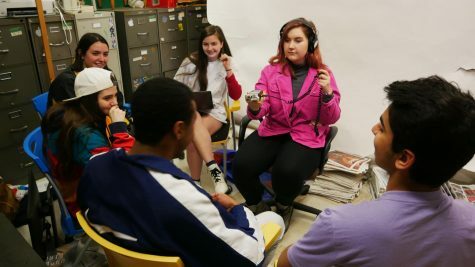 “It’s not like any other concert throughout the year,” sophomore Maayan Oved said. “This concert is very upbeat and fun, non-stressful. 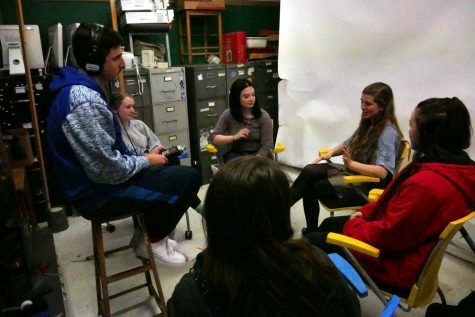 It’s the seniors' last concert too, which is sad, but for them it’s very special.” Photo by Katie Nalle. 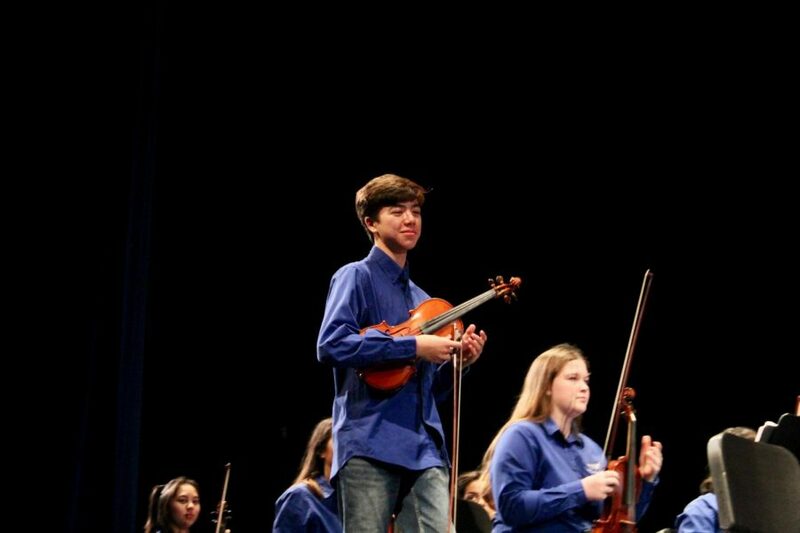 Sophomore Kai Cole walks on stage at the final orchestra concert of the year on Wednesday, May 23, and takes his place as Freshman Orchestra Concertmaster. 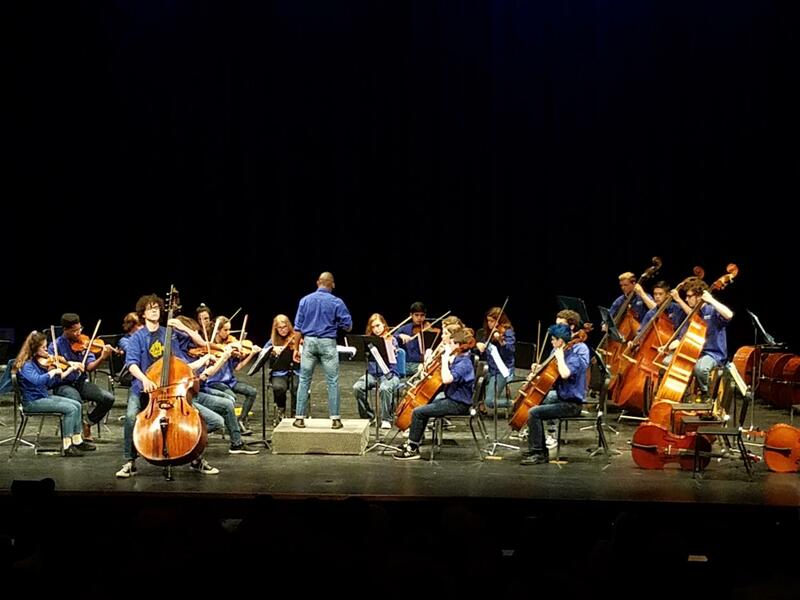 Each orchestra tunes on stage before they perform their pieces. “I don’t mind having to walk out on stage alone,” Cole says. “It’s actually pretty fun.” Photo by Sophia Shampton. Senior Pablo Kennedy performed the first movement of Concerto No.2 by Bottesini accompanied by a portion of the chamber orchestra at the last orchestra concert of the year tonight in the MAC. 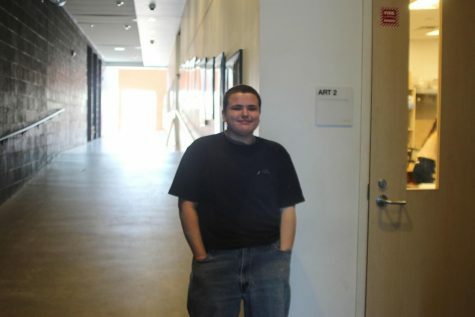 Senior Kasey Beck said that the last concert was bittersweet. "I'm glad it's over, but I'm also gonna miss the orchestra." Photo by Ashley Chamberlain. McCallum classical guitarists warm up in the Engineering Teaching Center building Monday at UT before playing their solos for a judge for the Texas State Solo Ensemble Competition. 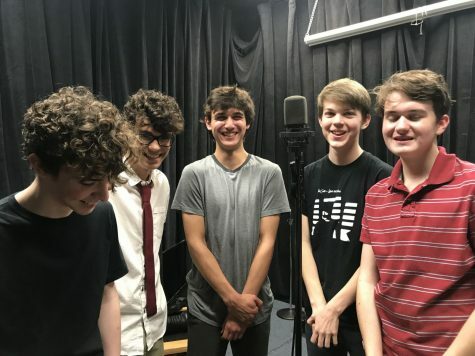 In order to qualify, the 14 guitarists who competed had previously received a 1 rating for their memorized pieces in the UIL Solo and Ensemble competition in January. Four gold medals were awarded to sophomore Riley Edwards, sophomore Sam Buford, freshman Will Tanner, and junior Marianna Vandenbout. Silver medals were awarded to senior Aaron Baldauf, sophomore Josh Betton (shown here), junior Brynach Hogan, junior Sam Finley, sophomore Abby Green, sophomore Richard Hernandez, senior Malcolm Jackson, junior Ethan Blanton and freshman Alex Graves. Photo by Kristen Tibbetts.